This year’s competition judge is West Fraser. Fraser was born in Savannah, GA in 1955. He is a true “Son of The Low Country”, with deep roots dating back to 1695 in Dorchester SC, to coastal Georgia’s colonial plantation history. He came of age on Hilton Head Island where he developed his love of the coastal environs that still today provides inspiration. Fifty eight artists packed up their gear and headed back home after Plein Air Easton drew to a close on July 17th. It was an exciting week filled with many opportunities to win cash prizes, grow as an artist, learn from accomplished colleagues and experience the beauty and hospitality of the Eastern Shore. Of the 58, 15 were from Maryland and 40 hailed from the East Coast, one from Canada and one from Amsterdam. Fifteen of the artists were new to the competition this year. 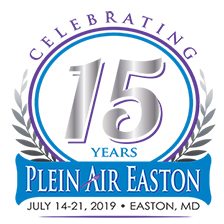 The 2016 Plein Air Easton Art Festival is coming to a climax with this weekend's Quick Draw Paint-Out and Small Painting Sunday. Get to know the artists' processes in this video blog as they paint at the Meet the Artists dinner at the historic Wye House, the Paint Oxford event, and the Farmers' Dinner at Triple Creek Winery. We talk to the artists during the Tilghman Island Pre-Competition Paint Out and the Artists' Orientation. 2016 Meet the Artist Dinner Location Announced! Read more about 2016 Meet the Artist Dinner Location Announced! On February 6, 2016 the publisher of Plein Air Magazine stewarded a group of one hundred artists and friends to Havana, Cuba. Local artist Betty Huang, owner of Studio B Gallery, and photographer Ted Mueller of Ted Mueller Photography were part of this historic trip. Ted has been responsible for documenting the events of Plein Air Easton for many years. These photos are used to both market and celebrate the event.